To Cite: Sayadpour Zanjani K, Aghaei-Moghadam E, Ghandi Y . Patent Ductus Arteriousus Device Closure in an Infant with Rubinstein–Taybi Syndrome, Iran J Pediatr. 2013 ; 23(6):708-709. Rubinstein–Taybi syndrome (RTS) was first described by Michail et al and subsequently by Rubinstein and Taybi. We present a typical six-month-old girl with RTS. Her mother had ovarian cancer and polyhydramnios during the pregnancy. Parents are closely related. There were frequent respiratory infections resulting in two hospital admissions. Physical examination revealed typical facial changes including downward-sloping palpebral fissures, prominent forehead, hypertelorism, limited mouth opening, large beaked nose, and high arched palate (Fig. 1). A history of increased tearing was compatible with nasolacrimal duct obstruction. Other features include general hypotonia with delayed developmental milestones, short and broad thumbs and toes (Fig. 1). Chest x-ray showed cardiomegaly (Fig. 2). She had normal karyotype. A continuous murmur was auscultable in the left upper parasternal region. Echocardiography showed a patent ductus arteriousus (PDA). Angiography confirmed a type E PDA with narrowest and aortic diameters of 3 and 6 mm, respectively. Systolic pressure in pulmonary artery was 45 mmHg. The PDA was closed with a detachable Cook coil 6.5×4 (William Cook Europe, Denmark). A small residue remained which decreased two weeks later on another echocardiogram. RTS is sporadic with a birth prevalence of 1 in 100000 to 125000[3,4]. Both sexes are equally affected. Typical facial expression (comical face) includes downward sloping palpebral fissures, hypertelorism, large beaked nose, malpositioned ears, limited mouth opening, long eye lashes, high arched eyebrows and hirsutism. Skeletal features consist of short stature, broad and deviated thumbs, broad toes, pes planus and scoliosis. Cardiac involvement occurs in about 36%, mostly as atrial or ventricular septal defects, PDA, coarctation of aorta, pulmonic stenosis and bicuspid aortic valve. Fig. 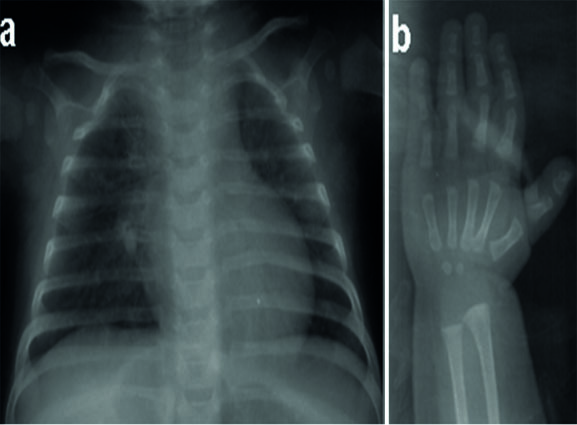 2: a. chest X-ray showing mild cardiomegaly with increased pulmonary vascular marking; b. hand X-ray demonstrating a broad thumb. Ocular features are described in most of the cases and include lacrimal duct obstruction, corneal abnormalities, glaucoma, cataract and coloboma. Common oral and dental manifestations are pouting lower lip, retro/micrognathia, high arched and narrow palate, cleft uvula and palate, hypodontia, maintenance of deciduous teeth, Talon cusps and enamel hypoplasia. Skin, gastrointestinal and nervous systems may be involved. These patients are prone to upper respiratory obstructions during sleeping or sedation. Upper respiratory infections are also common. Some patients carry a deletion at chromosome 16p13.3 or mutations in the CREB-binding protein (CREBBP or CBP) or EP300 gene (at 22q13)[9,10]. These abnormalities occur in about 55% of patients, leaving the diagnosis in 45% to rely on clinical features only. We presented a case of RTS with PDA. PDA device closure is the therapy of choice not only in genetically normal subjects, but also in syndromic patients[11,12]. As far as we know, this is the first report of PDA device closure in a RTS patient.